In 1994, New Mexico State University and the Navajo Agriculture Production Industry conducted a trial using Menefee Humate™ on carrots in Farmington, New Mexico. The trial consisted of two treatments. The first treatment, Control, was the grower’s standard fertility program. 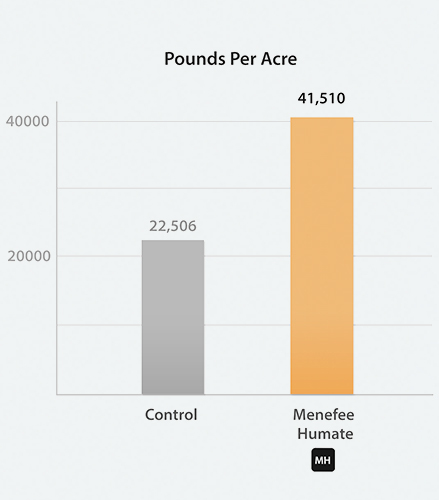 The second treatment, Menefee Humate, had 100 lbs of Menefee Humate™ per acre added to the fertility program. Treated rows experienced a 84% increase in yield with Menefee Humate™. Rows treated with Menefee Humate™ showed more consistent sizing and health, and they produced longer into the season.